What are the concerns with the Euro Cylinder and Handle set I have? The main issues with the Euro cylinder and handles on most UPVC or Composite doors is the lack of security features and ease of entry. There are many different Euro cylinders and handle types on the market which range from basic security to kitemarked security which is required by Insurance Companies to meet their requirements for your home insurance policy. 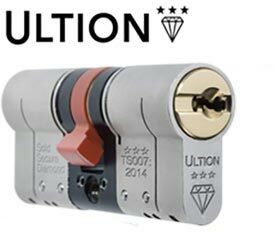 We can offer the full range of Euro Cylinders and handles but we only recommend using the top level of security 3 Star Kitemarked Euro Cylinder and 2 Star TS007 handles on your composite / UPVC doors. There are some concerning stats being published at the moment on home invasions and break in’s which show that out of 400,000 burglaries 74% broke through an external door, 58% of which happened when someone was at home in the property and 26% met the offender. This is why there are additional security measures that are recommended to take to secure your external doors for personal safety and security. Below is a video to show the differences from standard handles to Lock Lock handles with some stats and independent studies. Most UPVC and composite doors come with a high security multipoint lock in the door. This is the part on the edge of the door that has all the locking points that are thrown when you lift the handle. What they don’t all have is a high security cylinder and handle set. Below are 2 videos showing the difference between a high security cylinder and a standard cylinder and how quickly you can enter a property without the correct locks fitted. Handle Sets – Standard Units VS Lock Lock 2 Star TS007 Kitemarked. How can I easily tackle these issues without having to change my doors? These issues can easily be overcome with minimal installation. 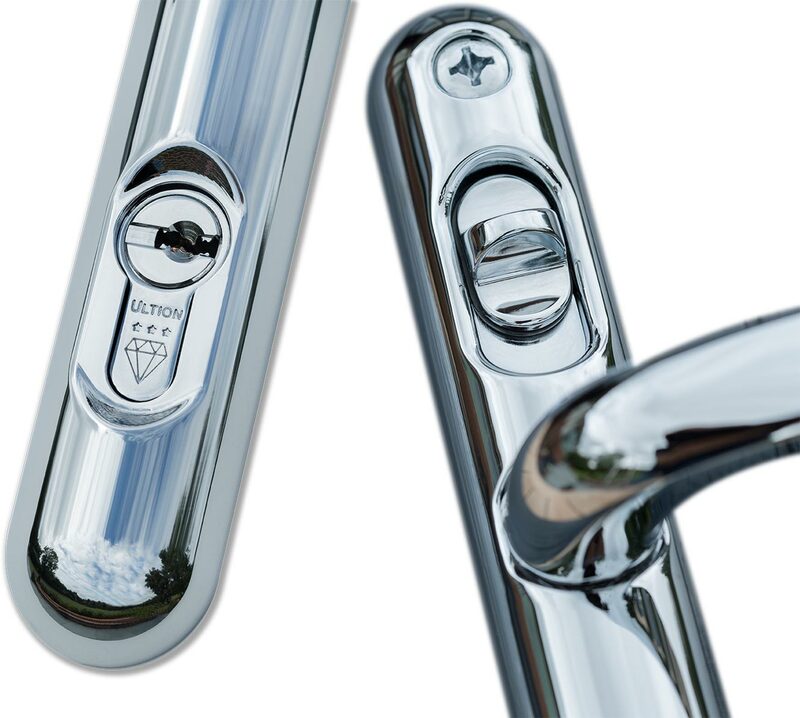 The Euro cylinders are extremely easy to install and require a single screw to be removed and the handles are available in 2 very common sizes which will work nearly all of multipoint locks that installed in the doors. These cylinders are the top security Euro cylinders. 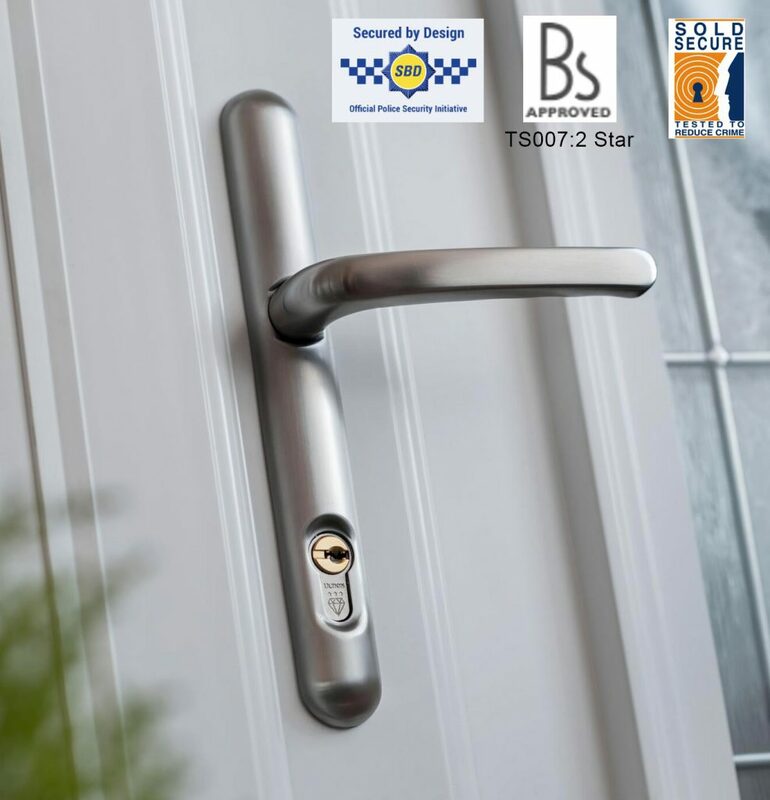 They are rated TS007-2014: 3 Star Security which is the highest level of security you can get with a Euro Cylinder. They have also been tested independently by Sold Secure and reached their highest rating of Diamond. 11 Security Pins – This gives these cylinders – 294970 key differs were as most cylinders even some other 3 star kitemarked cylinders only have 6 pins. Double Sacificual break protection on the external side of the cylinder. Lock Down mode – this is a Special pin that locks Cam in place if the cylinder has been snapped. Cylinder still operates internally but jams shut externally to prevent access. 20 Anti Drill points internally in the cylinder. Most cylinders have 2 or 3. The Lock Lock handles are the only handles that have received the TS007 2 star rating along with Secured by Design (Police Approval) and a Sold Secure rating. The design is unique with a specially designed curved plate on both sides which makes gripping the handles in Mole grips or a wrench nearly impossible. The internal handle plate has a locking snib that when pressed down engages the spindle block which locks the square spindle in place, therefore, making it impossible to open the external handle. The external spindle has been designed with a fault line that will break if the external handle is forced with excessive downward pressure which makes it extremely difficult to get in through the door. Fail Safe Spindle Block – You can only lock the spindle block once the handle has been lifted and the Multipoint lock engaged. Specially designed Spindle – Spindle has a fault line to prevent forcing of the handle but also has 2 grub screws and a spindle knuckle to prevent it being pulled out or smashed through the door. Comes with 12.9 grade, high strength steel alloy M6 fixing bolts that are 210% stronger than the standard M5 Steel bolts. Handles construction has 2 layers of copper and 2 layers of nickel before the finishing layer to give these handles unrivaled weather protection. They far exceed the 480 hours saltwater test that is required of them. When our team at the Lockshop Warehouse discuss locks with customers in the office or over the phone a lot of customers are knowledgeable about the wooden door requirements, how the door requires a 5 lever BS3621 lock to meet the Insurance requirements. Unfortunately, as the UPVC and Composite doors are a little less well-known customers believe they have the correct locks fitted but a lot of the time they have the very basic level Cylinder and handle set fitted. There are plenty of videos online showing how the locks can be picked, drilled and snapped and these Euro cylinders are not up to standard. Unfortunately, a lot of people have these on their doors unaware of the danger this poses. If you have any questions on your door security and would like some helpful assistance either checking the security level of your current locks or would like help to upgrade your security please let us know and we will happily help guide you through it. You can get in touch either at – [email protected] or 01323 416426.